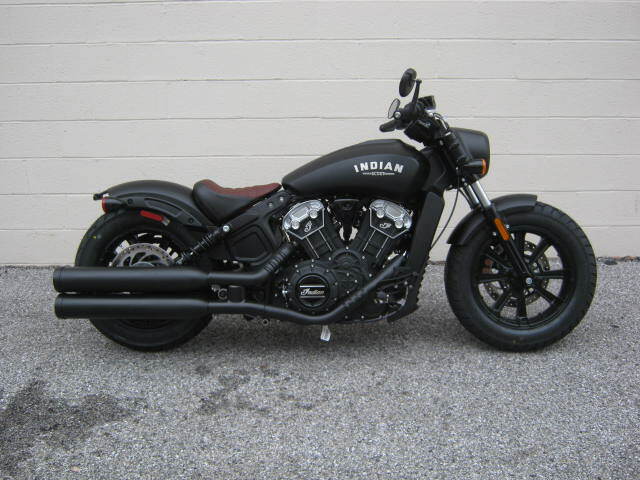 THE AMAZING, AWARD-WINNING INDIAN SCOUT BOBBER! OLD-SCHOOL COOL MEETS LEGENDARY BOBBER STYLE AND FORMS ONE OF THE COOLEST BIKES TO EVER CRUISE THE PAVEMENT! Don’t chase your dreams. Hunt Them Down! Make a statement with an unapologetic symbol of minimalist styling. Slammed stance. Chopped fenders. Knobby tires. Blacked-out and striped-down. The 2019 Indian Scout Bobber is no frills, all attitude. Grab on. Hold Fast. Your legend is just getting started. Why did the Scout win so many amazing awards when it was introduced in 2014? Well, quite simply by being the best and most unique motorcycle in it’s category, that’s how! Compare it to any cruiser of it’s size and the Scout comes out on top. More horsepower (100+) , more torque, cast-aluminium frame and swingarm, electronic fuel injection, genuine leather seat, and then there is the lineage….. The Scout was the engineering LEADER in the motorcycle world for almost 50 years. Now it’s back with a look that hearkens to yesterday, yet with an amazing new powerplant and frame launching the bike into the next 100 years! So stop by today and throw a leg over this amazing new ride. Now in-stock and ready for your next adventure!